Before Combat Seoni casts mage armor and extended shield (using her metamagic adept ability) before the start of the encounter. During Combat In combat, Seoni serves as artillery from range, blasting foes with magic missile, lightning bolt, and scorching ray. Without mage armor and shield, Seoni's statistics are AC 17, touch 15, flat-footed 14. 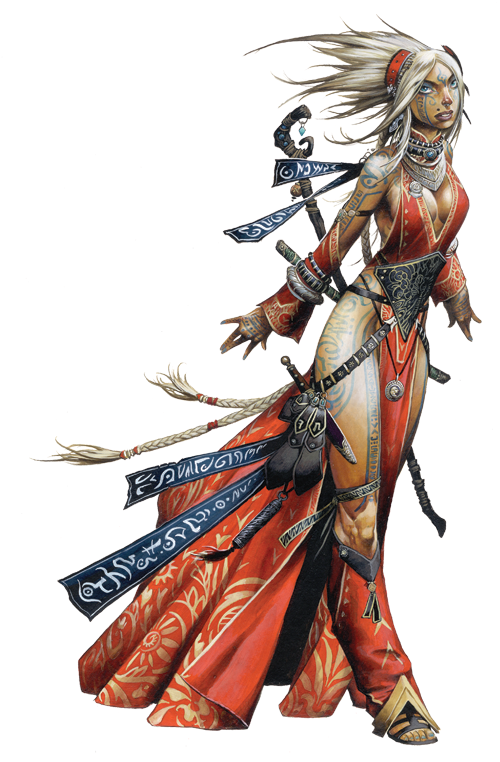 A member of the wanderers known as Varisians, Seoni wears the magical markings of her culture in the elaborate tattoos that crisscross her body. But her path was not to be the path of tradition. A caravan master's daughter who spent much of her youth traveling, she was expected to one day either lead her own caravan or perhaps develop a talent for reading the harrow, the fortune-telling cards of her people. One night, while her family camped at the edge of the mysterious Lurkwood, young Seoni wandered out of sight of her people's cooking fires. There she found a great white tree, its ancient roots twisted around a ring of rune-carved stone. As she investigated, the tree's bark fell away, revealing elaborate symbols and images that related a brief tale—that of her own short life. Seoni fled, but returned with her kin soon after to find nothing more than a normal old tree and a strange rock. Regardless, the images upon the wood carved themselves into Seoni's mind, and she promised that she would never submit to letting another choose her destiny. From that point onward, she delved into the mysteries of her homeland, eventually even unlocking sorcerous power within herself—an ancient sorcery unlike the common magic of her people. When she came of age, she sought to continue her wandering life, but this time along routes she chose and in pursuit of her own ambitions.